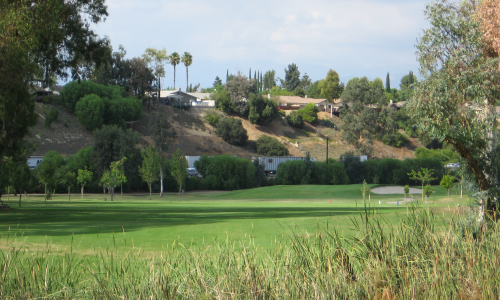 The first hole at Diamond Bar Golf Course is one of the most challenging holes on the course. This long par 4 requires a good drive and a good iron to reach the sloping green. Hole 2 requires a strategic drive up the left side of the fairway. Hit long here and you’ll find yourself with a tough chip shot back up to the green. A lengthy par 3, this third hole plays slightly uphill and requires you to stay below the hole to avoid a fast putt down the sloped green. A tougher par 5, you’ll need to favor the left of this sloped fairway and avoid the right side of the hole to keep your score down. Hole 5 allows you to take advantage of a short par 4 with an easy fairway and left-side bunkers that are reachable off the tee. Grip it and rip it on this short par 5 for a second shot with a long iron or hybrid to the sixth hole’s well-guarded green. One of the more difficult driving holes on the course, Hole 7 corners you into a fairway hit with a reachable bunker on the left and a thick tree line on the right. The eighth hole is the trickiest on the course, presenting a 220-yard straight shot off the tee with dangers on either side. Watch out for the creek that runs along the right side of the green! Hole 9 is as tough as it looks. With two hefty bunkers guarding the small green, control and precision are important here. To beat this deceiving downhill par 4, you’ll have to hit a drive straight down the middle of the fairway, then use a wedge to reach the smallest green on the course. Control is key on Hole 11 with another long drive that will have you holding your breath as you swing—too long and too far left will definitely increase your score here. A moderate par 5, the twelfth hole gives longer hitters a break with a chance to hit the green in two shots, though once you’re there, you’ll have to contend with one of the most difficult greens on the course. This long hole is made even more challenging with its play directly into the wind—beware of the breeze! Hole 14 is a hard dogleg right that requires a master strategist to make the par 4. With O.B. to the left and bunkers to the right, this final par 5 rewards those who shoot clean down the middle. Hole 16 is a par 4 that favors long hitters but leaves the rest having to play this hole the hard way. Hit with caution on this downhill par 3; it’s easy to overshoot the green on this short hole, especially with the wind in play. Finish your game with one of the hardest par 4’s around; even a solid drive will land you up on the hill with a scarce view of the green. *Junior Policy: No junior may receive junior rates before 10:00 a.m., seven days a week, unless their name is on the waitlist. NOTE: Seniors MUST purchase a Los Angeles County Senior Card in order to receive discounted rates and privileges. Tee times may be made up to 7 days in advance. 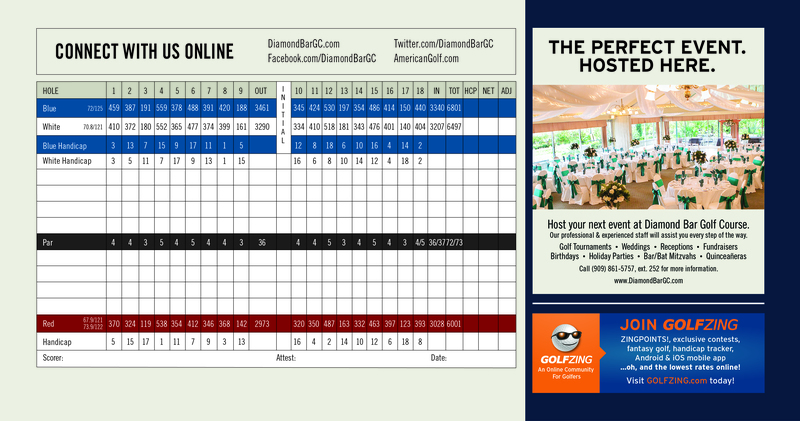 When you call to make your reservation, our staff will ask the number of players in your group, and the day and time you would like to play. We will do our best to accommodate you. We will require a phone number, and on weekends, a credit card number to reserve the time. Cancellations will be accepted up to 24 hours prior to your tee time. There will be a charge of $10 for each no-show and short show in your party, so please call in advance if your group size changes. 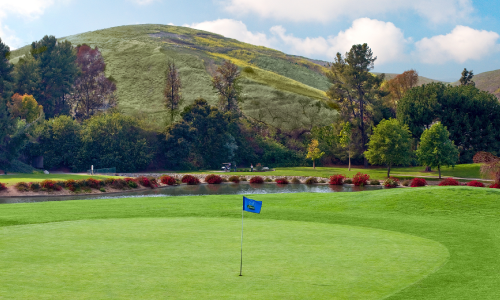 Designed by William F. Bell, one of the most prolific golf course architects of the twentieth century, Diamond Bar Golf Course rests in a location central to three major Southern California counties and offers an exceptional experience for those looking for a temporary respite from city life. Masterfully sculpted into a gently sloping landscape lined with trees for an added challenge, the course suits both casual and competitive golfers. Breathtaking mountains in the background complement the long layout with wide fairways and large quick greens, lending a distinctly refreshing tone to your day on the course. 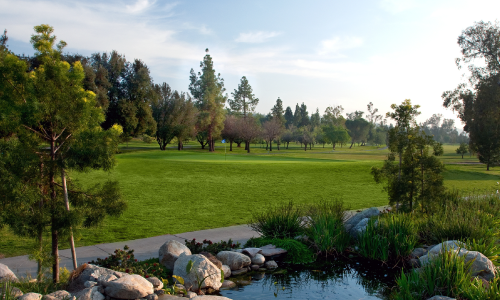 Additionally, Diamond Bar Golf Course features a number of remarkable amenities to accommodate your tournament, practice, and banquet needs. 22751 E. Golden Springs Dr.
(909) 861-8282 or click here.